Been diving in GPS Point? Please Vote! This dive site is heralded as one of the best sites of the Komodo National Park but it actually lies outside the park close to Banda Island. The site is a part of an area of submerged rock that makes up the island. 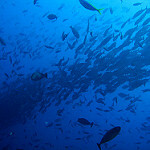 On the same dive, you can see many different sharks, Napoleon Wrasses, schools of barracuda and tuna. There have been dive trips where up to seven shark species have been seen. You do not have to go far to find nudibranchs, cuttlefish, scorpionfish, and hermit crabs, with all of these to be found around 5 meters. In September, hammerhead sharks can also be seen in large quantities, schooling around the reef. 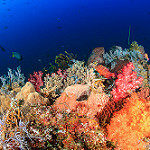 Unfortunately, in 1997 and in 1998, there was substantial dynamite fishing which damaged the corals and reduced the fish numbers. There has also been extensive shark finning reducing the numbers of sharks in the area. Large amounts of fish can still be found on the North Western corner where the current provides ample nutrients to bring up the numbers again. Given the location of the dive site, liveaboards are the normal way to visit the site as it is far from the national park and its resorts. However, it is well worth the trip and on calmer days, macro divers can even have fun delving amongst the staghorn and soft coral. Map of Komodo, GPS Point dive site.